There are loads of fun, creative advertising ideas that can help to further promote your pet business. Better yet, these don't necessarily cost a lot. Moreover, business cards can be very inexpensive. For example, Vista Print offers sets of 500 premium cards starting at $10. You can even design your business cards utilizing special templates the company provides. Or you can upload your pet shop's logo for a truly unique design. To ensure that people don't toss your business cards, you could go one step further and transform your cards into refrigerator magnets for a more lasting impression. Unlike larger daily newspapers and glossy magazines, advertising in smaller community weekly and niche newspapers is less costly. Plus, these reach more concentrated audiences than the larger publications, which are geared toward a broader segment of the population. Also, weeklies have a more extended shelf life than daily newspapers because they are on the street for longer periods of time. As someone who was an editor at a diverse variety of publications including dailies, glossy magazines, alternative newspapers and community weeklies, I can attest that you do get more bang for your advertising buck with weeklies and other community publications. Penny saver type publications are also excellent print advertising outlets because people peruse them specifically for the ads. The possibilities with this advertising are endless. You can have your business name embossed on everything from pens to coffee mugs and mouse pads, at reasonable costs. As I suggested in my blog post about environmentally friendly customer purchase shopping bag options, selling reusable totes with your pet shop's logo is not only earth-friendly, it's also a great way to advertise your business and diversify your inventory. There are tons of companies that sell branded reusable totes for businesses. A &apos;Furry&apos; Unique Advertising Concept! Meanwhile, another cute, creative advertising idea is to enlist your pet clients to serve as four-legged billboards. You could sell doggie T-shirts embossed with your pet shop's logo. For a less expensive option, you might consider selling bandanas for pooches. You could also periodically host contests and give a few of these away as prizes. So it's a win-win for everyone. There are all kinds of creative possibilities with this advertising concept. On an ongoing basis, a pet shop can host events featuring experts ranging from dog trainers to representatives from animal rescue groups and a pet psychic. If you want to go all out, you could come up with ways to interest the media in these events. One idea is to invite a local TV news personality who is a known pet lover to your pet shop for a special appearance, along with his or her pet, if possible. If they agree, you are guaranteed to get television coverage. 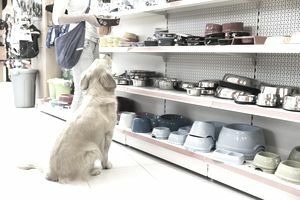 Another cool advertising and promotional idea are to hold in-store events that celebrate pet holidays, possibly with applicable items for sale, free pet treats, and contests. For example, October is Adopt a Dog Month. Why not hold a kickoff party for your canine clients? You could even host a doggie fashion show, with prizes for the best-dressed pets! For a list of national pet holidays, check out Gone-ta-Pott.com, a directory of every holiday imaginable. The list of really fun, creative, low-cost ways to advertise and promote a pet shop is virtually endless. All it takes is some imagination and the ability to think outside the box.